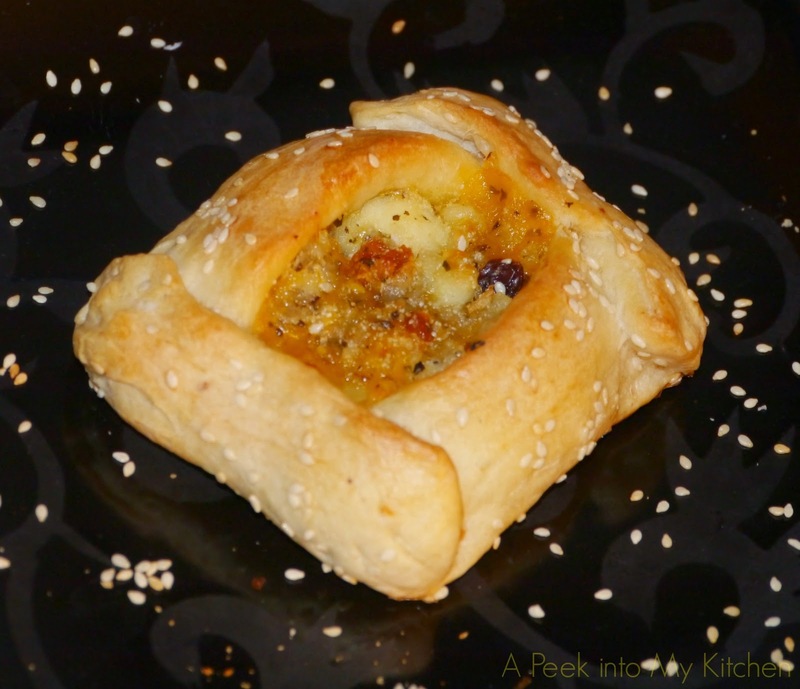 Aparna chose Flaounes, a cheesy, savory Easter pies from Cyprus for this month's We Knead to bake project. I opted for a egg less version, substituting eggs for yogurt and milk. Flaounes (pronounced "fla-OO-nez") are savory cheese pies baked for Greek Orthodox Easter, and traditionally made on Good Friday and are part of the fast-breaking meal after Lent when meat and cheese are not eaten. They are eaten at breakfast and also exchanged as gifts of friendship and goodwill. Flaounes are also made in semi-sweet and sweet variations. There are a couple of ingredients that go into the filling that are typically Cypriot/ Greek and they are “mehelepi” and “mastiki. Mehelepi (mahleb/ mahlab) is the ground dried pits of a wild Mediterranean cherry. Mastiki (mastic) is the dried resin from a kind of shrub. Both of these spices are quite common in Greek and Middle Eastern cuisine and they really have no good substitutes so if you can't find either, just leave them out. Flaounes can be shaped into triangles or squares, and just make sure that you press down the flaps well while folding the dough over the filling, or these pies will open up when they bake. Do take a look at this video where Paul Hollywood and Toni Buxtonmake Flaounes to get a good idea on how they’re shaped. First make the dough. I used my food processor but you can knead by hand. Put the flour, yeast, salt, sugar, and the flavoring ingredients (if you have them) into the bowl and pulse a couple of times to mix. Whisk together the yogurt, milk and melted butter in a small bowl and add it to the flour. Knead, adding just enough water, till you have a soft, smooth and elastic dough which is just short of sticky. Add water/ flour as necessary to get this consistency of dough. Too much flour will spoil the texture of the pies. Place the dough in a well-oiled bowl, turning to coat it well. Cover loosely and let the dough rise for about 1 to 2 hours, until it is double in volume. Once it has risen, deflate the dough by pressing it out and folding it a few times. Then place it in a container (the dough will rise so use a large enough container), cover loosely and refrigerate for about 2 hours. You can leave this in the fridge overnight too, if you want to make these pies in two stages. While the dough is sitting for the first rise, make the filling. Mix all the ingredients for the filling, except the milk (or egg if you’re using it) with a fork. If you’re not using the filling immediately, keep it aside and add the milk only when you’re ready to use the filling. The filling should be somewhat like a stiff paste, joust moist rather than wet. Now shape the Flaounes. Divide the dough into 8 equal pieces (10 if you want slightly smaller pies). Lightly oil your work surface and rolling pin. Then roll each piece into a 5 to 6” round. The round of dough should be thinner rather than thick. If it is too thick you will have a very “bready” pie, but make sure that your round of dough is not too thin to support/ carry the weight of the filling. Divide the filling also into 8 (or 10) portions. Spread the sesame seeds on a large plate and place the round of dough on it, in the center, and press down lightly. 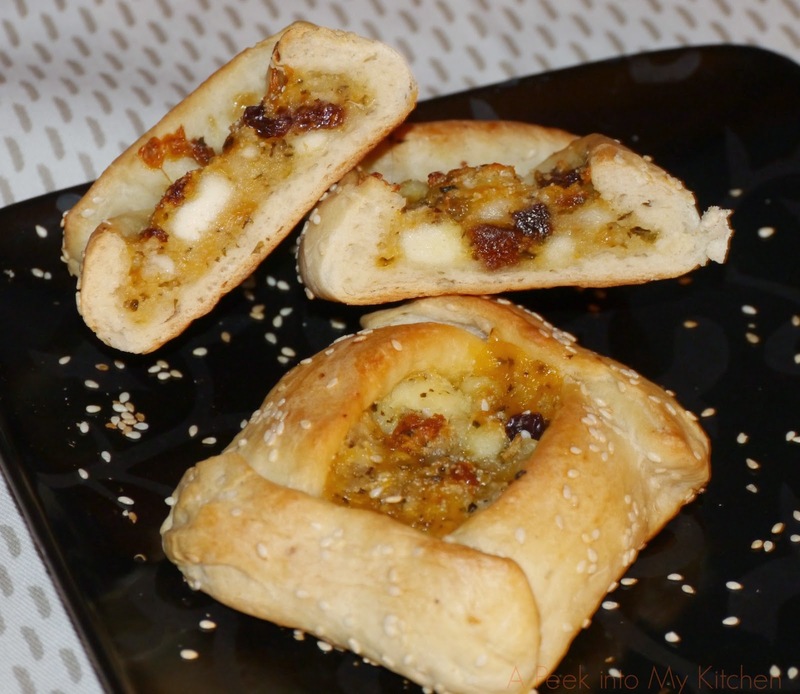 This makes for an easy way to coat the Flaounes with sesame seeds. Now place the round on your working surface and put one portion of filling (about a generous tablespoon full of it) in the middle of the round of dough and spread it lightly, leaving about 1” free at the edge. You can make triangular or square Flaounes, and I personally feel that the square ones (more traditional) were less bready and nicer to eat. For the square ones, fold the two opposite edges over the filling leaving the center exposed. Now fold over the other two edges as well so you have a square pocket with the filling showing at the center. Press down the sealed points with the tines of a fork. For the triangular Flaounes, pull up the edges of the dough at three points and partially fold over the filling, one after the other, leaving the uncovered. Use the paste of flour and milk (or beaten egg) to seal the flaps of dough well. Press down the sealed points with the tines of a fork. It is important to seal the pies well or they will open up during the second rise/ baking. Place the shaped pies on a greased or parchment lined baking sheet, leaving 2 to 3” between them, and let them rise for about 40 minutes. Just before baking them, brush the sides (dough part) with milk (or beaten egg) and bake the Flaounes at 190C (375F) for 25 to 30 minutes till they’re done, golden and the cheese filling is puffed up. Let them cool on a rack. Serve them warm or at room temperature. 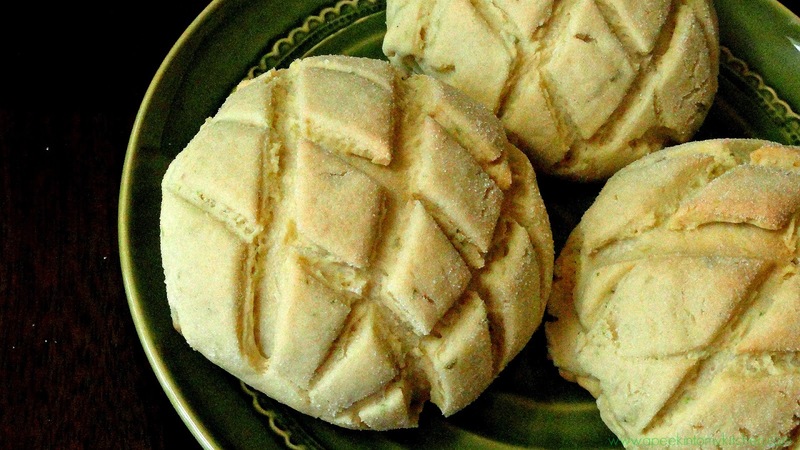 This recipe makes 8 or 10 Flaounes, about the size of one’s palm. These pies keep for two days at room temperature in an airtight container. 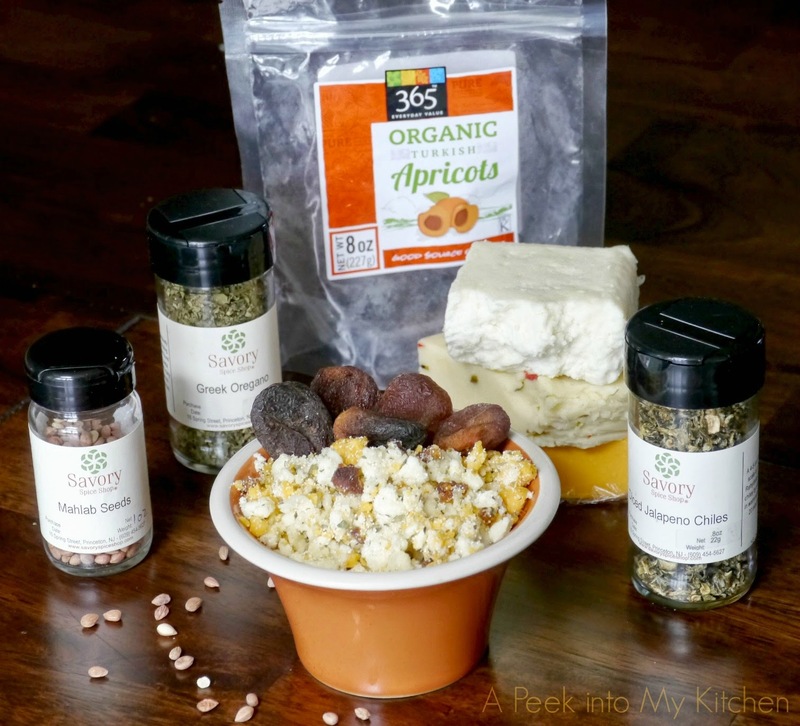 You can freeze the extras to eat later. Place the cut mango, neem flower, turmeric powder and salt in a large skillet and add water just until immersed. Cook until half tender. Meanwhile, melt jaggery with 1/2 cup water. Strain to remove impurities. 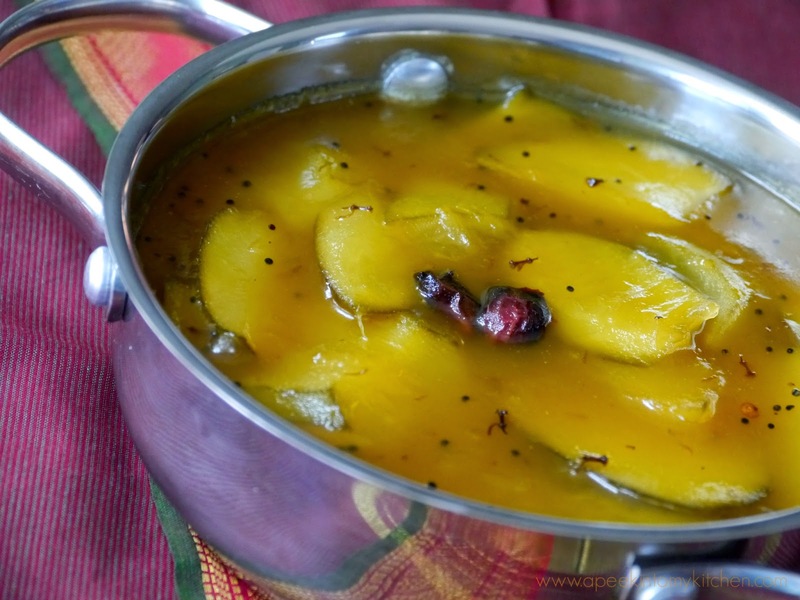 Add the jaggery syrup to the mango mixture and cook for about 10 minutes. Combine rice flour in cold water and make a thick paste. Add it to the mango mixture and mix well. Let it boil for a minute and switch off the stove. This makes the pachadi to become thick and sauce like consistency. Adjust the thickness consistency according to your preference. Heat oil in a small skillet and splutter mustard seeds. Turn of the heat and add the broken red chilies. Pour over the pachadi and mix well. 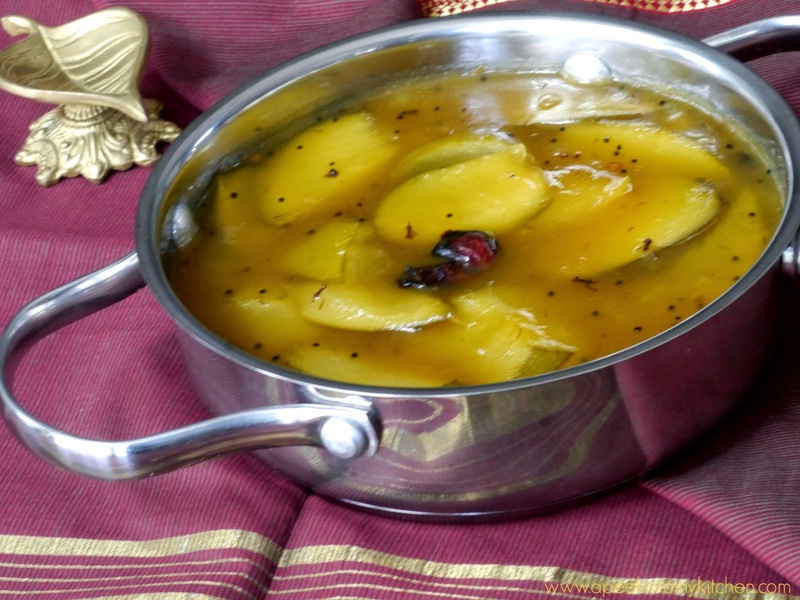 Labels: Mango, Pachadi, south Indian, Sweet, Tamil New Year. Due to sickness and travel, I was not able to post last month's We Knead to Bake project on time. But better late than never. Finally found time to bake these yummy and crunchy cookie dough covered bread. Thanks Aparna for choosing this bread. Carefully take on ball of bread dough (it will have puffed up a little so don’t deflate it), and place the circle of cookie dough on top of it. Gently press the cookie dough edge to the bread dough ball so that it covers the top and sides of the ball, but leaves the bottom open. Gently, holding the covered bread dough by the underside, press it into some castor sugar. 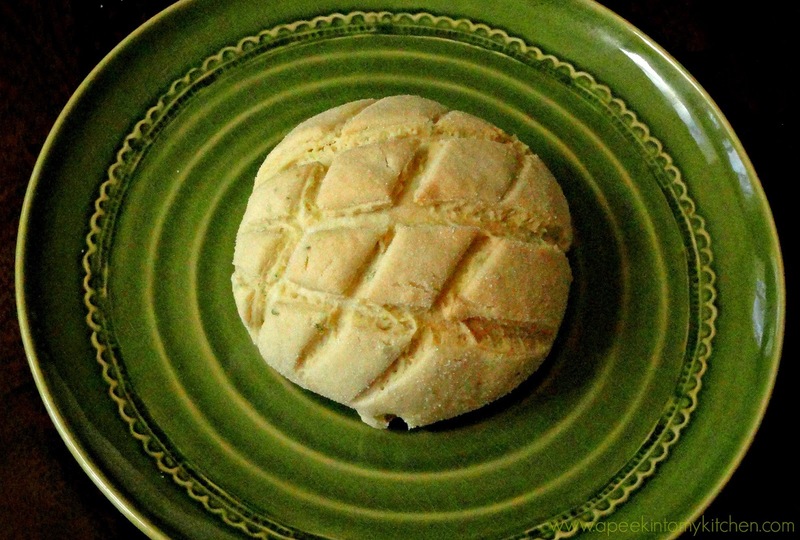 This recipe makes 8 medium to largish Melon Pan. Melon Pan are best eaten the day they are made. However warming them slightly before serving the next day is also fine.